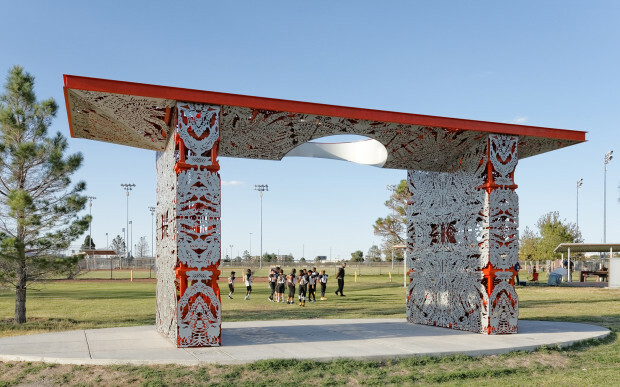 Entitled “Sun Pavilion,” the public art installation creates an iconic, destination shade structure for Blackie Chesher Park, a large urban park and sports complex in El Paso, Texas. Inspired by Hueco Tanks, an ancient Desert Archaic and Native American Cultural site, patterns of indigenous plant species are illuminated by the ever-changing and ever-present sunlight during the day, and interior LED illumination at night. 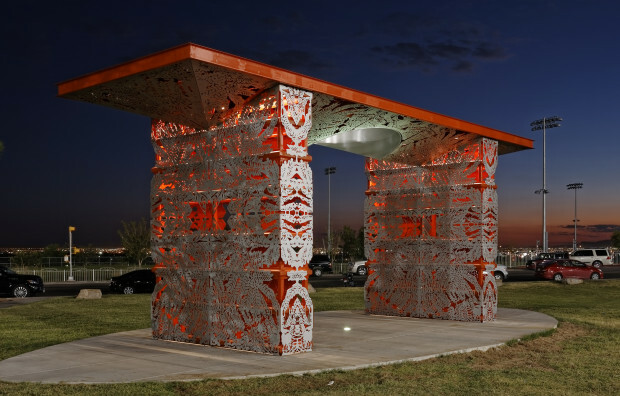 Laser-jet cut panels in polychromed aluminum evoke the craft traditions of papel picado, or cut-paper patterns and pierced-metal lanterns of the area. Framing a place to gather, the “Sun Pavilion” is a place to shelter and share the stories of the day with each other. This public art project reinforces the role of regional parks as civic anchors and places of community gathering and cohesion and with imagination, the patterned shadows and colors echo faces of the past and put us together in the present with each other creating a special place, a distinctive place, for Blackie Chesher Park and the community. The project began with research and discovery to immerse ourselves in the history and character of the region and the site. There is nothing more important than listening carefully to the people that live and work and play in a given location. Experiencing the use of the park, both day and night, was especially revealing. Our “artistic fact-finding” investigation led us into the surrounding Chihuahuan Desert, where we got to see the ancient petroglyphs and pictographs on the rock formations of Hueco Tanks firsthand. These amazing images immediately influenced the direction of our work. 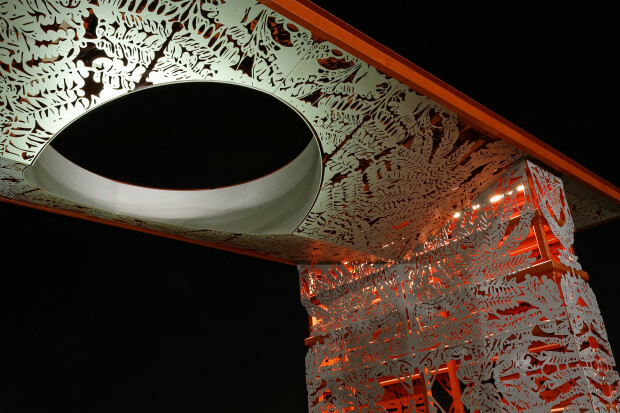 Throughout the process, we were also experimenting and testing digital imagery in laser-cut models, sharing this development with a variety of large-scale metal fabricators. We forged a close, design-assist relationship with a well-known fabricator. 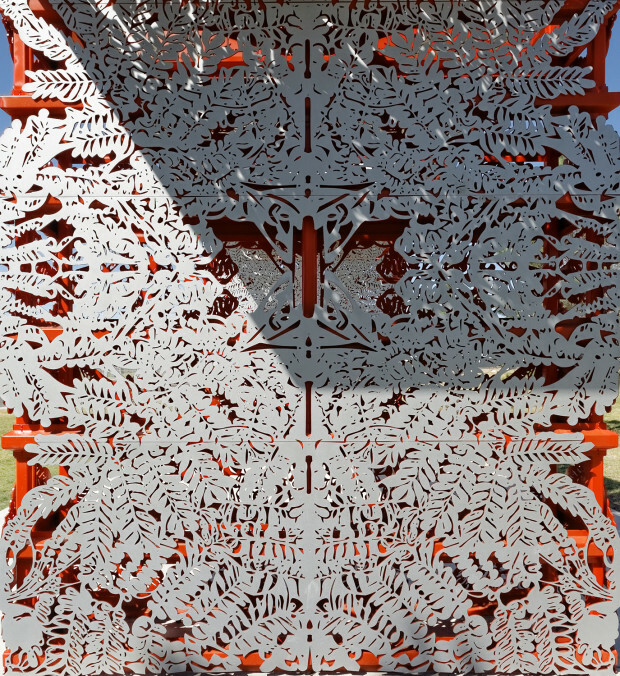 Through this multi-faceted back-and-forth collaboration between artists, community, and fabricator, we were able to explore and communicate, a meaningful narrative within the dynamic pavilion structure. 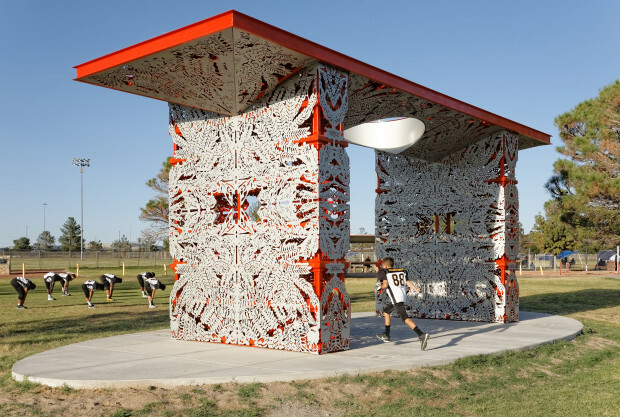 The “Sun Pavilion” has been recognized as an integrated Placemaking component within the major urban park. 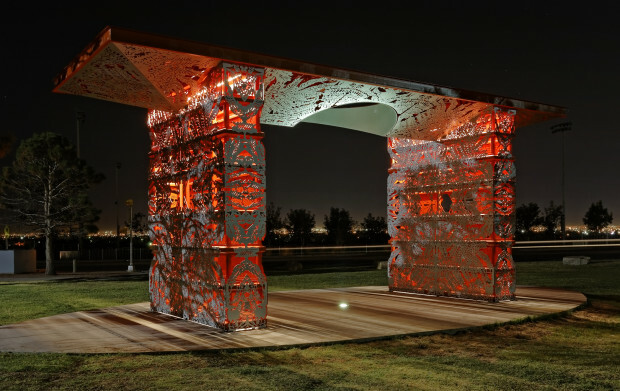 While it is directly influenced by specific cultural and ethnographic imagery, the contemporary form, capturing the movement of the sun, is both sculpture and functional shelter.